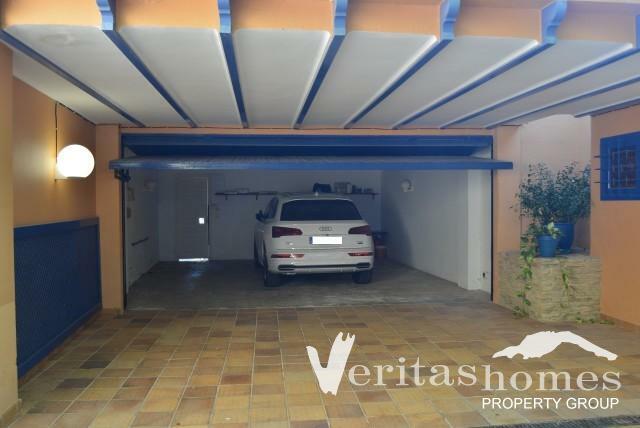 Unique opportunity in this very prestigious Calle Sevilla in Mojácar Playa! The property is currently configured as a 4 bedroomed Villa but could also be easily configured as a 6 or more bedroomed property by simply re-arranging furniture! The Villa boasts over 500 mts² built and is set on a private plot in excess of 2,000 mts² with a fabulous secluded garden, private pool and sea view, roof terrace with 360° views and within a very short walking distance to the “Parador” Hotel in Mojácar Playa and the commercial centre. There is also a separate studio with approx. 140 mts2. This studio has an independet access. One of the benefits of this property is that it is very secluded and in fact very close to the beach or services in the sea front. It is definitely worth a visit if you are looking for something with lots of character to either live in or holiday in style or simply as an investment in such a desirable area. Mojácar Village is a short drive away. The house is also strategically located for golf enthusiasts. The Marina de la Torre Golf Resort is 5 minutes’ drive, Valle del Este Golf Resort 15 minutes’ drive and Desert Springs Golf Resort is a mere 20 minutes’ drive. Other coastal resorts within easy reach are Garrucha and Vera Playa. This is an excellent opportunity for those looking to either live well or holiday in style and right by the beach in Mojácar Playa. For more information or to book a viewing appointment please visit our office or contact us by phone or e-mail.